The Macropis Cuckoo Bee is one of the rarest bees in North America, partly because of its specialized ecological associations. It is a nest parasite of oil-collecting bees of the genus Macropis which, in turn, are dependent on oil-producing flowers of the genus Lysimachia. In fact, the cuckoo bee – which much like its feather-bearing counterpart does not build a nest of its own, but lays its eggs in those of other species instead – is so rare that it was thought to have gone extinct until it was collected in Nova Scotia, Canada, in the early 2000s. As a result, the Macropis Cuckoo Bee was brought to the attention of the Committee on the Status of Endangered Wildlife in Canada (COSEWIC). Recently, an individual reported from Alberta, Canada, brought new hope for the survival of the species. In addition to previously collected specimens from Ontario, this record greatly expands the known range of the cuckoo. Scientists Dr Cory S Sheffield, Royal Saskatchewan Museum, Canada, who was the one to rediscover the "extinct" species in Nova Scotia, and Jennifer Heron, British Columbia Ministry of Environment & Climate Change Strategy, present their new data, and discuss the conservation status of this species in their paper, published in the open access journal Biodiversity Data Journal. "This species has a very interesting biology," they say, "being a nest parasite – or cuckoo – of another group of bees that in turn have very specialized dietary needs." The hosts, bees of the genus Macropis (which themselves are quite rare) are entirely dependent on plants of the primrose genus Lysimachia. Moreover, they only go after those Lysimachia species whose flowers produce oil droplets, which the insects collect and feed to their larvae. Thus, Macropis bees require these oil-producing flowers to exist just like Macropis Cuckoo Bees need their hosts and their nests. Curiously, this reliance, as suggested by previous studies on related European species, has made the female cuckoos develop the ability to find their host's nests by the smell of the floral oils. "This level of co-dependence between flower, bee, and cuckoo bee, makes for a very tenuous existence, especially for the cuckoo," the authors comment. "The recent specimen from Alberta lets us know that the species is still out there, and is more widespread than we thought." 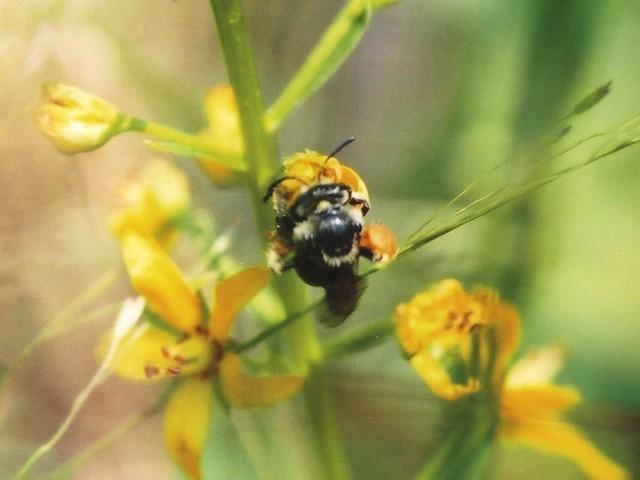 In conclusion, the authors suggest that continuing to monitor for populations of rare bees, and documenting historic records, are crucial for conservation status assessments of at-risk species. "Biodiversity Data Journal provides a great venue to share this type of information with our colleagues for regional, national, and international efforts for species conservation," they note.